The department store chain is currently trying to raise up to £200m from existing lenders. Under that deal shareholders, including Sports Direct, could see the value of their investments all but wiped-out. Abandoning that refinancing deal would be a condition of a Sports Direct offer. Debenhams would also not be able to go into administration or insolvency. Debenhams is expecting confirmation of the refinancing deal this week, and has already said a takeover offer from Mr Ashley would not immediately solve its funding crisis. Sports Direct deputy chief financial officer Chris Wootton said shareholders were "sick and tired of being ignored, cast aside and trampled underfoot by the lenders of Debenhams". The sports retailer is continuing with plans to force an emergency general meeting in May to try to oust all but one of the directors on Debenhams' board. 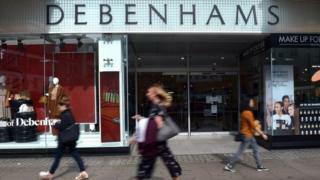 Laith Khalaf, a senior analyst at Hargreaves Lansdown, said: "The Debenhams board are bound by their duty to shareholders to give this proposal proper consideration, though it's not as yet a firm offer for the company," he said. "This is not conventional corporate behaviour by any means, but that's what we've come to expect from the Sports Direct chief executive. "What we haven't had from either Mike Ashley or Debenhams is a strategic plan for the long term future of the company, and today that still remains sadly lacking," he added. Debenhams shares surged in early trading.